Finally some lighting for my pictures! These shots are almost as good as Jess’s. I feel like centering them and showing them full size. Ok, maybe they’re not that good, but they’re a lot better than most I take. Tastespotting is certainly a possibility. I woke up at 6:00 AM and needed to get moving right away. I jumped on the 2/3, got a seat, and took out my computer to start typing all the way to Borough Hall. Turns out that my internet doesn’t work at the place that I’m renting. I knew it might be a problem when the person I’m subletting from said “Well, we don’t have the internet, but there’s two nodes that we pick up for free.” Obviously she didn’t say nodes; anyone that knows what a node is would make the daily $1.50 sacrifice for reliable internet. My roommates could care less, they’re playing Mario Kart Wii all night; I envy them. Last time I played (for the first time) I smoked the poor guy. He was high, but I stand by my 1-0 record. I needed some wi-fi and Iris CafÃ© was just the place to get it; I was there at 7:15. Turns out that this wi-filess guy hangs out on the stoop in front of the cafe at night bundled up, typing away on a laptop. This has been happening for a few nights now. That’s what you get in these transitional neighborhoods; upwardly mobile bums. Rachel hit us with both barrels: the Raisin Stickybun (top), Ham and Cheddar Biscuit (pic), Eggs and Soldiers (below), The Plated Breakfast, (bottom), and Caramel Apple Oatmeal (pic). I am a pretty big sticky bun fan. My mom makes these awesome cinnamon rolls (she’s one of the best chefs I know – love you mom!) and we were talking about them. In a blind taste test between my mom’s cinnamon rolls and these sticky buns, I have a feeling that these sticky buns are going to win a majority of the time. Jackie left her half uneaten on the plate for about a minute after we had this conversation and I asked her if she was going to finish it. I would certainly have eaten another sticky bun if it was placed in front of me; damn the waistline. 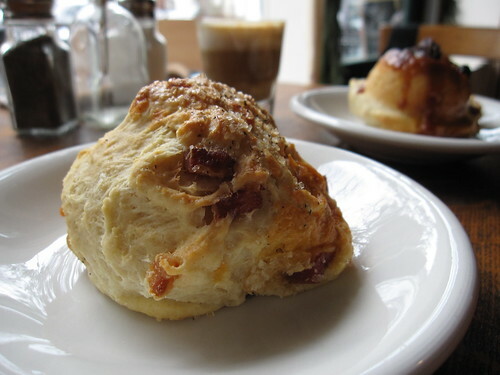 The ham and cheddar biscuit was moist and cheddary, dappled with thick, smoky bacon. 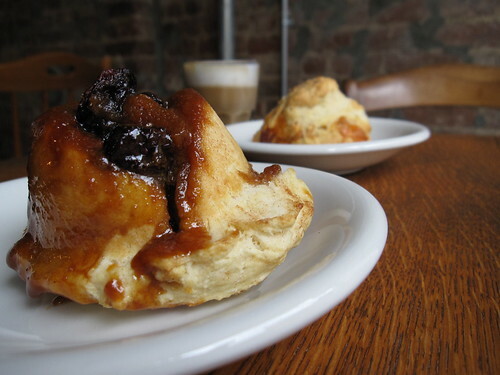 Sometimes I shy away from scones because I’ve had more than a few dry ones in my time. It was not the case with this biscuit. I should have asked for butter with this guy; it might have placed it neck-and-neck with the sticky bun. I screwed up my oatmeal. 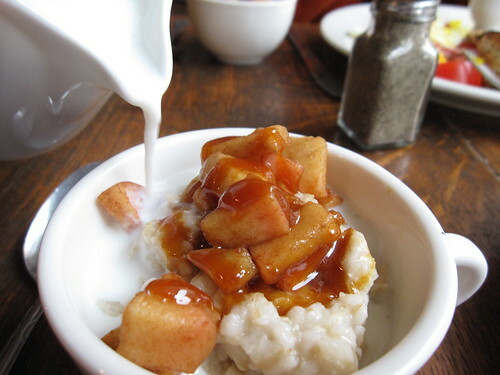 I usually add gobs of brown sugar to each bowl I have, but this time, I left it plain. The frothy milk accompanying the dish was a very nice touch, and I thought the drizzle of house-made caramel would be enough for me. Turns out I needed that brown sugar. Next time. The main courses bathed us in their yolky glory for for the mid-part of our meal. I only discovered how beautiful a runny egg can be two years ago, but I haven’t looked back since. We made short work of the thick multi-grain that came with both breakfasts. 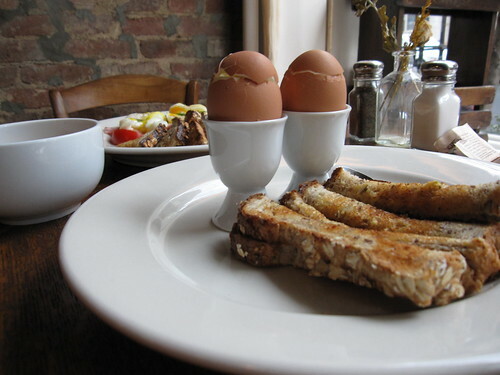 Soldiers are pieces of toast sliced into sticks, just perfect for dipping into a soft-boiled egg, so my breakfast centered around the phenomenon I’d just grown to love. 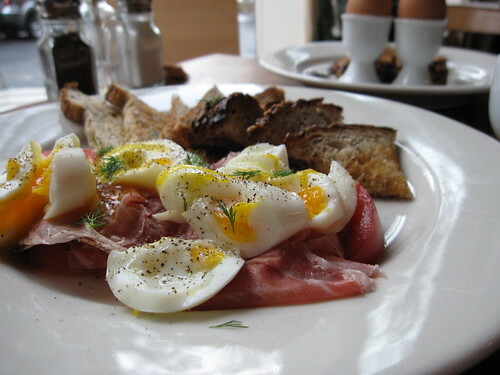 The plated breakfast offered us tomatoes, “Surryano” ham (link), medium-hard-boiled eggs and toast. It’s been an immediate house favorite. Rachel has been open for six weeks and has a pretty nice rush going on throughout the day. I overheard conversations of more than a few first-timers happy to finally have the shop in their neighborhood. There are a few more restaurants opening up and a park exiting onto Joralemon completing this summer that should increase traffic even more. The space is super cool and would be fantastic for some open mic or acoustic and they’ve applied for a liquor license. Come by, get some Stumptown and an amazing sticky bun, and look for some awesome changes coming in the next few months! The IRL Arts Foundation and The Wandering Foodie thank Iris CafÃ© for providing this meal.